For security reasons, clients cannot save their questionnaire half way through, and must complete it in one go. Hence, reseting the questionnaire may be the only option when your client needs to introduce his or her data again. Step 1: Go to My clients. Step 2: Click on the name of your client to access his/her client record. Step 3: Click on the Status tab, on the top of the screen. On the bottom of the screen, you will find the Questionnaire Status table. 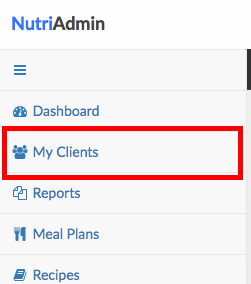 This table contains information about the different questionnaires you have in your NutriAdmin account in relation to your client. You can see whether a questionnaire has been sent, received, and on which date(s) here. Step 5: Carefully read the information you will see in the screen. Then, click on Confirm Reset to proceed. Step 6: After a few seconds, your client's questionnaire will be reset. You will notice that the questionnaire status table will be updated to show that the sent/returned date are now undefined. 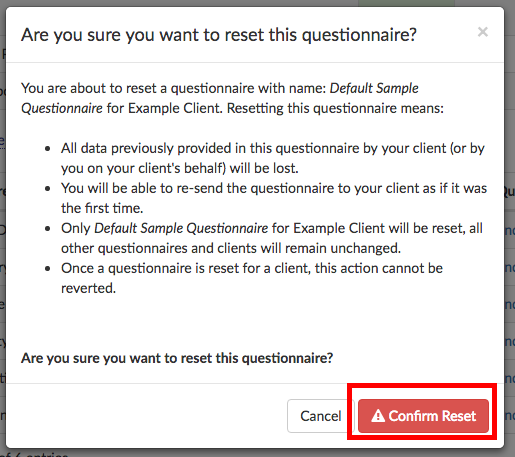 After you reset a questionnaire, you will be able to re-send it to a client normally as you would if this was the first time sending the form to the client.